No need to choose between convenience and looks: this handsome backpack/crossbody bucket bag has both. With backpacks, one generally has to make a hard choice between convenience and looks. The zippers and compartments necessary for convenience make elegance difficult to achieve. 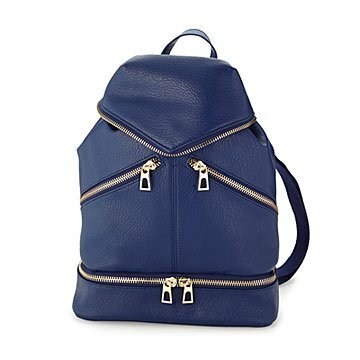 This handsome backpack/crossbody bucket bag is the exception: its extra-large zippers are positioned for bold visual impact. Diagonal side compartments hold keys, parking or transit cards, gloves, and other small-ish items you need easy access to. The bottom section has elastic holders and plastic pockets, thoughtfully designed to securely hold a tech device (even a tablet), a wallet, TSA-size liquids, and makeup. Adjustable straps make it convertible from a backpack to crossbody bucket bag. Made of high quality vegan leather, with handbag-style hardware, this good-looking bag makes looking put-together a cinch, and saves your decision-making energy for more important issues, like what kind of snacks to put in it. Made in China.